Plant based eating does not have to be boring! People think all we eat are salads but that is so far from the truth. Since going plant based 4 years ago we have discovered so many new and exciting foods. You are going to love today’s recipe using the Instant Pot Garlic Mashed Potatoes from my last post and You Tube Video. 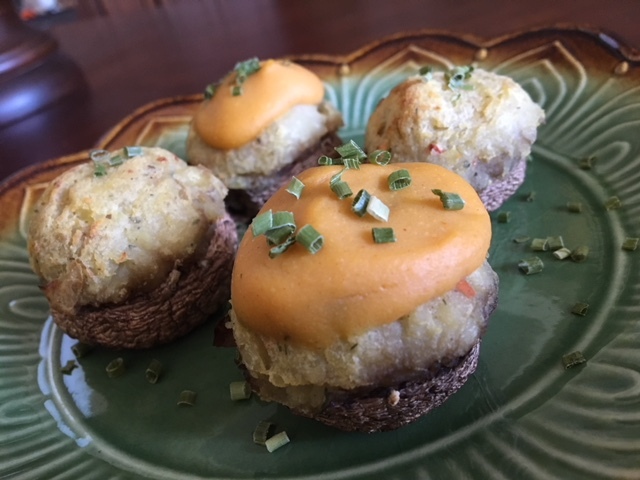 I stuffed those yummy spuds into a big portobello mushroom cap and topped it off with some vegan cheeze sauce. Popped them in the air fryer and we were over the moon happy! It is a main dish worthy of company and might I add, it’s elegant enough to serve for a holiday meal. We thought you might enjoy seeing a video of this recipe being made and cooked in the Breville Smart Oven Air Fryer. To make this recipe you will need the Instant Pot Garlic Mashed Potatoes recipe. Just for fun I tried stuffing Baby Bellas and they turned out amazing! This would be such a fun appetizer for the holidays or anytime. I topped some with Donna’s Vegan Cheeze Sauce and left some plain and loved them both. A little drizzle of Napa Valley Naturals Grand Reserve Balsamic or a Balsamic Glaze would guild the lily on these! Make the Garlic Mashed potatoes and the cheeze sauce. Prep the mushrooms by removing the gills and the stem gently with a spoon. Preheat the air fryer to 400 degrees. Make sure the air fry rack is in the proper position. Fill each mushroom cap with mashed potato mixture. When oven has reached temperature place the filled mushroom caps carefully on the rack. Set time for 20 minutes. When timer goes off pull out the rack using a hand mitt and spread some of the cheeze sauce over the potatoes. Place back in the oven at 400 degrees until the cheeze sauce is hot about 5 minutes. Remove to a platter or plate and sprinkle with fresh or dried chive or sliced green onions. 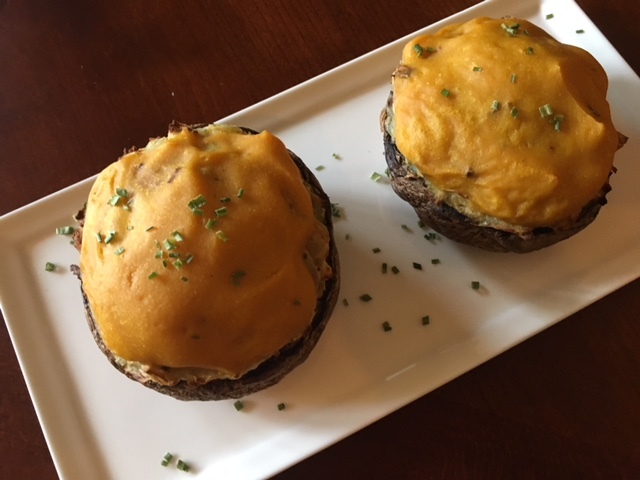 Serving Suggestions: Drizzle the finished stuffed mushrooms with a thick syrupy balsamic like Napa Valley Naturals Grand Reserve Balsamic vinegar or use a Balsamic Glaze. Serve as an entree along with oven roasted or air fried vegetables, coleslaw or a big beautiful green salad. Variations: Stuff Baby Bella mushrooms for appetizers with or with out the cheeze sauce and perhaps a drizzle of a thick balsamic vinegar like Napa Valley Naturals Grand Reserve just before serving. Oven Mitt – The one I have is no longer available but this one is similar. Crispy Cooker Mat – Our friend Shayda told us about these mats so we ordered them. Cut these to fit the mesh racks and it makes clean up easier but still allows air flow. PBW Cleaner – The longer we use the mesh fryer racks the harder they are to clean. We soak them in a solution of hot water and a tablespoon of the PBW cleaner in a large plastic wash tub. They clean up like new! We are compiling a list of videos to make in the future and checking into getting some new gadgets to make the videos better – on a shoe string budget. You will notice that we have added some Amazon associate links. When you use our links for a purchase it helps support the work we do here on the blog and our videos with out any extra cost to you. Thank you so much for your support! We know your time is valuable and when you take the time to leave a comment it is greatly appreciated! I love hearing from you dear readers! Feel free to leave a comment or ask a question. These look absolutely delicious! Now that I have a Breville Air, I’ll be making them too! Thanks for all the recipes and kitchen tips! You are so welcome Colleen! It’s fun to share what we are learning and pass it forward! It’s just barely out of the box, and I’ve lots of questions. First is do you find the listed accessories to be useful? Specifically the cutting board, the additional food trays (with the holes), and the pizza stone? And any, and all, first steps to becoming brave enough to use it are welcomed. Happy Health Breville to you!